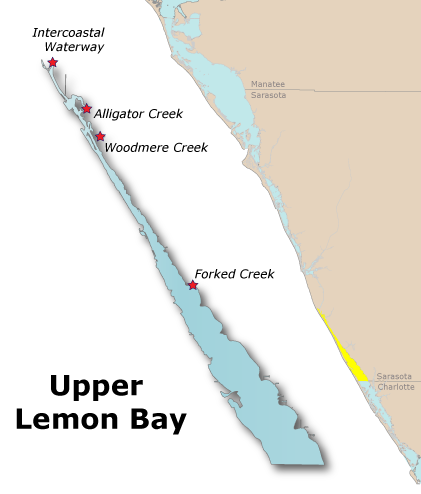 Water quality indicators for Upper Lemon Bay showed deterioration in 2016. After an improvement in chlorophyll a concentration in 2014, this water quality measure continued the worsening trend observed in 2015 with further increases in 2016. The mean concentration of both total nitrogen and total phosphorus also showed an increasing trend. The higher chlorophyll a and nitrogen levels continued the rating for those water quality measures as “Caution”, causing the overall rating for Upper Lemon Bay also to remain as “Caution”. Water Quality: Chlorophyll a mean concentration in 2016 was of 0.0136 mg/l, exceeding the threshold of 0.0089 mg/l. Mean nitrogen concentration increased to 0.6362 mg/l, exceeding the threshold of 0.560 mg/l. Mean phosophorus concentration also elevated, and at 0.138 mg/l is “Excellent” The mean for chlorophyll a was calculated as an arithmetic mean and the means for nitrogen and phosphorus were calculated as geometric means (per the Numeric Nutrient Criteria outlined in the Florida Administrative Code, section 62-302.532).